﻿• ﻿2) ﻿A ﻿family ﻿of ﻿guidelines ﻿(concepts, ﻿policies, ﻿principles, ﻿rules, ﻿patterns, ﻿interfaces ﻿and ﻿standards) ﻿to ﻿use ﻿when ﻿building ﻿a ﻿new ﻿IT ﻿capability. ﻿• ﻿The ﻿communications ﻿of ﻿strategy ﻿and ﻿derived ﻿business ﻿initiatives ﻿throughout ﻿the ﻿organization, ﻿and ﻿the ﻿governance ﻿of ﻿those ﻿activities, ﻿projects ﻿and ﻿efforts ﻿across ﻿functional ﻿organization ﻿and ﻿business ﻿unit ﻿boundaries ﻿towards ﻿delivering ﻿those ﻿strategic ﻿directions, ﻿and ﻿associated ﻿goals ﻿and ﻿metrics. ﻿• ﻿The ﻿development ﻿of ﻿an ﻿organization’s ﻿strategy, ﻿derived ﻿initiatives ﻿in ﻿support ﻿of ﻿those ﻿strategies, ﻿and ﻿governance ﻿of ﻿the ﻿coordinated ﻿tactical ﻿project ﻿delivery ﻿effort ﻿for ﻿those ﻿initiatives. 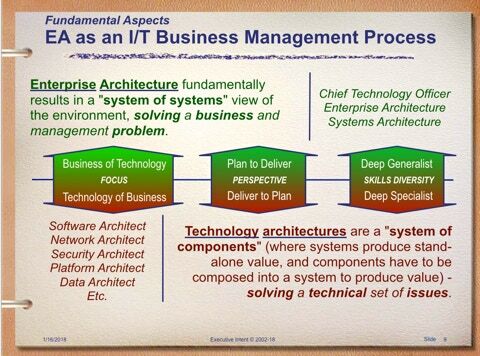 ﻿Enterprise ﻿Architecture ﻿fundamentally ﻿results ﻿in ﻿a ﻿"system ﻿of ﻿systems" ﻿view ﻿of ﻿the ﻿environment, ﻿solving ﻿a ﻿business ﻿and ﻿management ﻿problem. ﻿Technology ﻿architectures ﻿are ﻿a ﻿"system ﻿of ﻿components" ﻿(where ﻿systems ﻿produce ﻿stand-alone ﻿value, ﻿and ﻿components ﻿have ﻿to ﻿be ﻿composed ﻿into ﻿a ﻿system ﻿to ﻿produce ﻿value) ﻿- ﻿solving ﻿a ﻿technical ﻿set ﻿of ﻿issues. 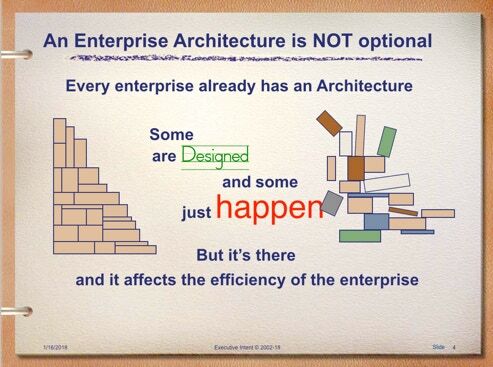 ﻿The ﻿purpose ﻿of ﻿the ﻿Enterprise ﻿Architecture ﻿is ﻿just ﻿that ﻿- ﻿to ﻿enable ﻿the ﻿organization ﻿to ﻿reach ﻿its ﻿goals. ﻿ But ﻿how? ﻿If ﻿the ﻿key ﻿is ﻿impartial ﻿facilitation, ﻿negotiation, ﻿and ﻿conflict ﻿resolution ﻿- ﻿the ﻿soft ﻿methods ﻿- ﻿then ﻿why ﻿is ﻿it ﻿called ﻿"architecture"? ﻿What ﻿is ﻿the ﻿purpose ﻿of ﻿this ﻿endless ﻿accumulation ﻿of ﻿the ﻿enterprise ﻿models, ﻿gap ﻿analysis, ﻿and ﻿other ﻿EA ﻿mechanisms? ﻿EA ﻿is ﻿a ﻿journey, ﻿not ﻿a ﻿destination ﻿.... ﻿a ﻿process, ﻿not ﻿an ﻿outcome. ﻿You ﻿don&apos;t ﻿end ﻿up ﻿with ﻿a ﻿product ﻿design ﻿- ﻿that&apos;s ﻿the ﻿technical ﻿architect&apos;s ﻿job ﻿- ﻿you ﻿create ﻿a ﻿dynamic ﻿road ﻿map ﻿of ﻿how ﻿to ﻿get ﻿to ﻿your ﻿destination, ﻿only ﻿to ﻿find ﻿the ﻿journey ﻿points ﻿to ﻿a ﻿new ﻿destination. ﻿Along ﻿the ﻿way, ﻿the ﻿goal ﻿is ﻿to ﻿eliminate ﻿non-strategy ﻿supporting ﻿activity, ﻿and ﻿ensure ﻿that ﻿everyone ﻿delivering ﻿business ﻿initiatives ﻿have ﻿a ﻿coordinated ﻿understanding ﻿of ﻿everyone&apos;s ﻿related ﻿activity, ﻿and ﻿are ﻿making ﻿the ﻿right ﻿decisions ﻿for ﻿the ﻿right ﻿reasons ﻿- ﻿a ﻿consistent ﻿decision ﻿framework ﻿so ﻿that ﻿everyone&apos;s ﻿response ﻿to ﻿events ﻿produce ﻿the ﻿appropriate ﻿outcomes. ﻿The ﻿purpose ﻿of ﻿EA ﻿is ﻿to ﻿provide ﻿the ﻿coordination ﻿and ﻿guidance ﻿of ﻿strategic ﻿initiatives ﻿delivery, ﻿holistically ﻿across ﻿the ﻿enterprise ﻿(allegiance ﻿to ﻿no ﻿one ﻿functional ﻿organization, ﻿but ﻿to ﻿the ﻿entire ﻿company). 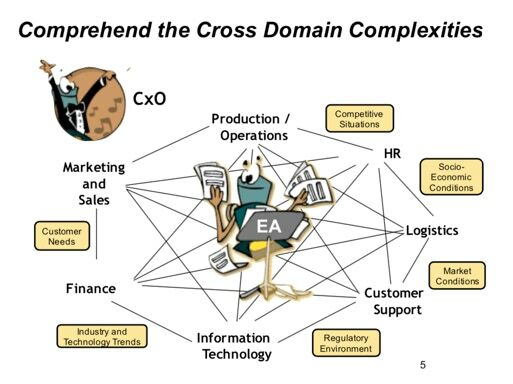 ﻿That ﻿EA ﻿role ﻿is ﻿the ﻿steward ﻿of ﻿all ﻿the ﻿component ﻿pieces, ﻿and ﻿how ﻿they ﻿fit ﻿together, ﻿overlap, ﻿and ﻿the ﻿gaps. ﻿The ﻿ability ﻿to ﻿recognize ﻿patterns, ﻿abstract ﻿the ﻿concepts ﻿and ﻿be ﻿able ﻿to ﻿delve ﻿back ﻿into ﻿concrete ﻿implementation ﻿seamlessly, ﻿is ﻿key ﻿to ﻿EA ﻿success. ﻿EA ﻿is ﻿directly ﻿analogous ﻿to ﻿the ﻿building ﻿architect ﻿or ﻿city ﻿planner ﻿- ﻿enough ﻿understanding ﻿of ﻿everything ﻿in ﻿scope ﻿to ﻿coordinate ﻿everything ﻿in ﻿scope ﻿without ﻿bias ﻿to ﻿any ﻿one ﻿discipline. ﻿EA ﻿Purpose: ﻿To ﻿facilitate ﻿the ﻿effective ﻿engineering ﻿(engineering ﻿in ﻿its’ ﻿broadest ﻿sense ﻿- ﻿people, ﻿process ﻿and ﻿technology) ﻿of ﻿business ﻿initiatives, ﻿in ﻿order ﻿to ﻿delivery ﻿strategy, ﻿and ﻿eliminate ﻿wasted ﻿effort.